I know you’re all coming to the County this summer (www.visitpe.ca) so here’s the shopping list of wines to buy, and I’ll be adding more picks in the month ahead. The following are from a recent tasting of almost a hundred County wines at the Terroir and Cheese events in Picton. Before giving my report I feel it’s necessary to look at the broader picture of what makes a great wine zone. Are we talking just wine or do we include the experience of the place? Scenery, accessibility, diversity, friendliness and food are certainly considerations to be factored in if we include the experience. Between sips, tastes and spits I asked anyone who would speak to me to rate their County experience and the responses were 100% favourable. “Quaint, not-commercial, friendly and different” were the most used words. Okay, the County passes the first test. As a resident I’d like to add that it gets even better if you choose to live here full time. Because I’ve tasted just about everything produced here over the past five years I’ve no trouble with the ‘great wine zone’ tag, but I have an issue with some pricing and therefore value. 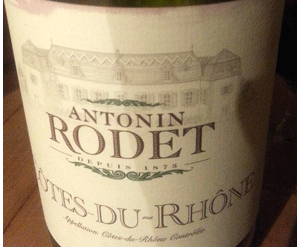 However, this year I noticed a pull-back in pricing and a few attempts at reasonably priced wines. My wine of the show sells for $14.95. Chardonnay and Pinot Noir are the County’s flagship wines and the best can certainly hold their own, dollar-for-dollar, with anything from California or France. If you buy wines in the $30-$40 range I recommend you check out the following wineries: Norman Hardie, Keint-he, Closson-Chase, Rosehall Run, Long Dog and Exultet. 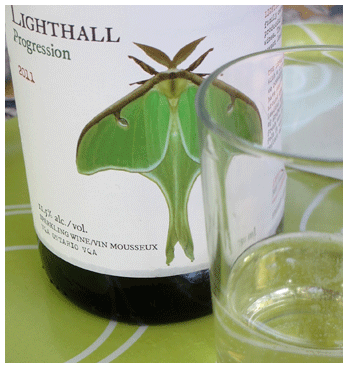 For Chardonnay alone add Huff and Lighthall to the list. And you’re strictly after Pinot, be sure to visit the boys in the barn at The Old Third. Sparkling is emerging as another County success with Hinterland leading the way with a whole range of styles from classic Brut to lighthearted, less dry editions. Huff and The Grange make a Brut to challenge Veuve Cliquot, and Lighthall has just released a Prosecco-style sparkling that’s perfect for summer events. But what about wines under $25 or even under $20? Sandbanks is the leader in this category with wines that are blends of County and Niagara – however, in this report I’m concentrating on 100% local. For reasonably priced County reds I suggest you try Gamay such as Casa-Dea 10 Gamay $14.95, The Grange ‘Trumpour’s Mill’ 09 Gamay $14.95, Sugar Bush 09 Gamay $17.95, and the novel, very meaty Bergeron 10 Gamay $21.00. Harwood’s 09 St-Lauren $20 has the tart/refreshing character of Gamay. Best value County Pinot is Casa-Dea $19.95 and the rich ’n seductive 07 Half Moon Bay $25. Most charming red is Stanners 10 Cabernet Franc $25. (The County seems to have the potential to produce very Pinot-like Cab Franc – makes me happy). For a walk on the wild side check-out Lacey 10 Baco Noir $20.00. Dark and dense – the workingman’s Barolo! In whites, Pinot Gris is the value buy, led by the minerally fresh 10 Grange ‘Trumpour’s Mill’ $14.95. Lacey provides a higher octane experience with their 11Pinot Gris $22.00, and Stanners is going the super pleasant route with their salmon pink 10 Pinot Gris $25.00. Lacey also has an uber-refreshing 11 Gewurztraminer $25. Best deal in reasonably priced rich Chardonnay is 10 Black Prince Reserve $19.95. 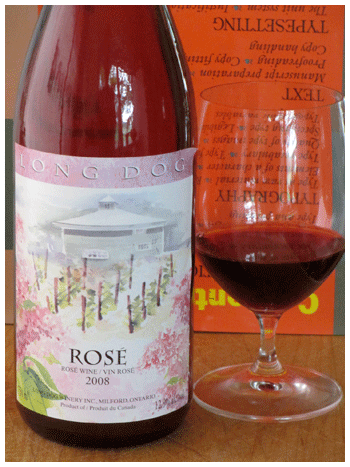 Had there been retail opportunities at the events the wines I’d have taken home for warm weather drinking would have been 08 Long Dog Rosé $20 – wonderful combination of charm and refreshment. And the energy driven, citrussy, classy/outstanding Closson Chase 09 ‘Closson Chase Vineyard’ Chardonnay $29.95. 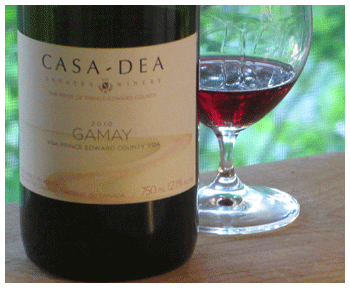 And of course the wine-of-show, the highly spirited Casa Dea 10 Gamay $14.95.